I wish I were sleeping right now. I woke up about an hour and a half ago and can't fall back asleep. The alarm will be going off in about 30 minutes. Today is my ultrasound with the specialist to determine if the baby has club feet. I'm feeling a bit anxious about it. Right now I'm wishing that we don't find out, but then I guess I would like to know so that we can find the right doctors now, ahead of time. Matt can't make it to the appointment, so I'm going it alone. Today is the start of statewide standardized testing, which requires a certified teacher to be in the classroom, so his finding a substitute is next to impossible. We haven't told any of our family members about the baby and this appointment because we figure there's no need to make them worry about something that may not even be a problem, so having one of them go with me is out of the question. I'll manage. 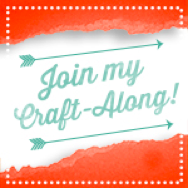 This upcoming week I'm making the switch from Blogger to Typepad, though I may not do it until the weekend. I've been thinking about it for a while and feel like now is the time, before I accumulate too many more posts. 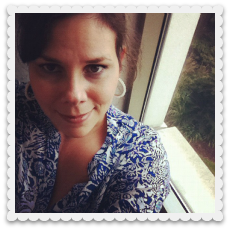 I'm most worried about losing all my archives when I try to export this blogger weblog over to typepad. With my luck I'll mess it all up! The instructions seem pretty straight forward, but I'm still a bit skeptical. I'll make an announcement when I do, so you can update your link, bloglines, whatever. Here it is, Friday night, and I'm surfing the net while Matt and Lily are playing a game of Memory. What an exciting life I lead! I'm about to to soak in the tub - too bad I can't enjoy a glass of wine while I'm in there. I wanted to follow up to the post I made earlier today about the fabric. I found the coupon, so I dropped a chunk of change on that. In a few short days I'll have some new fabric to play with. Actually, I'm gearing up for only using what I have on hand for the month of April. I can do that. I'll probably be doing my Mother's Day gifts then, so I had to get the supplies now, and um, a few fun things for me. My bath is calling me - I hope you all have a good weekend! 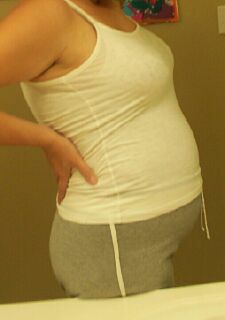 Yesterday marked 32 weeks for me. Wow, my time is running out. 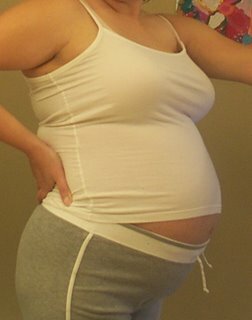 There won't be many more of these pictures, as I will most probably deliver this kid at 38 weeks via scheduled c-section. As you can see, I am quite large. 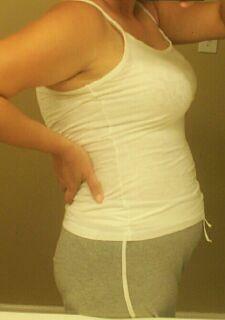 My belly has finally caught up with me - I'm slowing down BIG TIME. I'm still taking the stairs at work, but I think my morning walks are coming to an end. Besides it being pretty painful, I don't think my walking partners want to go at a turtle's pace. I'll still give it a shot if I feel up to it, but I couldn't this morning. I discovered something new in the last few days - NEW stretch marks. I didn't think that was possible. The old faded ones are starting to regain that purplish hue as well. Yep, my abdominal skin is shot. Oh well, it's worth it! You can see me grow and grow and grow here. I LIVE for Fridays these days. Friday holds the anticipation of the weekend, of all the possibilities that lie ahead in the next two days. Friday means that I can sleep past 5:30 am the next morning. Friday night means that we can order take out and the kids don't have to take a bath. If I choose, I can stay up later than 10 pm because there's no need to get up before dawn the next morning. Oh, how I love Friday! I have a whole list of things I'd like to accomplish this weekend, but I have a feeling I won't get to do half of them. My body is wearing out. Yesterday was my achiest day yet. By 7pm last night I was laying down with tears in my eyes because I hurt so badly. This big ole baby must be moving further south because my c-section scar was burning, the ligaments down there were aching, and my pubic bone felt like it was splitting in half. I get a little nervous when I start feeling pain down there because I have a low lying placenta, which means that I'm at a risk for hemorrhaging. I'm gonna try to do my best to get a little accomplished, but I'll most likely be doing a whole lotta resting. I had an ultrasound and regular OB appointment today. I wish I could say that all I got was good news. There is a possibility that my baby could have club feet. Not that having club feet is the most devastating thing in the world, but nobody wants to hear that something may be wrong with their baby. Nothing can be done at this point, but I won't find out for sure until I have another ultrasound with the maternal fetal specialist in two weeks. I was more upset about this before I learned anything about it. It seems to be fairly common (1 out of 1000 births) and can be corrected with casts and or surgery. Of course I'm hoping that my baby doesn't have this. It is possible that nothing is wrong, but club feet couldn't be ruled out due to how the baby was positioned. If you're the praying type, we sure could use a few. It's that time again. 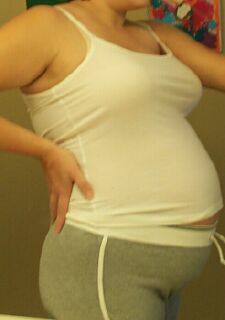 Can you believe that I'm already 28 weeks??? 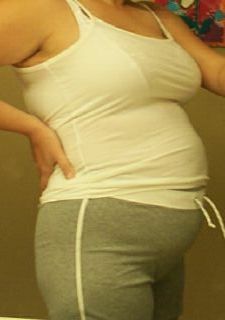 Gosh, this pregnancy has flown by. 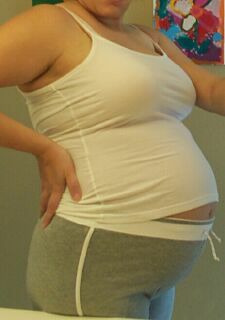 Now that the third trimester is here I have a feeling that I am going to slow down - a lot. All I want to do in my spare time is rest. I'm so freaking tired all the time. I'm sure I'll go through a burst of energy at the end, but right now I'm not feeling it. Since I'm seeing my Dr. every 2 weeks at this point I'll be updating pictures every two weeks as well. 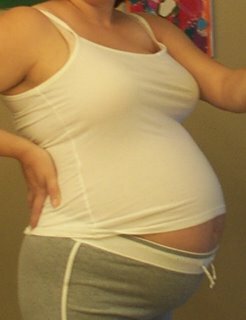 I can't even imagine how much bigger my belly is going to stretch. Today I picked up two new maternity t-shirts at Target. I had to buy XXL. All of my large and x-large tops are getting too small in both length and girth. What's the deal with maternity clothes these days? 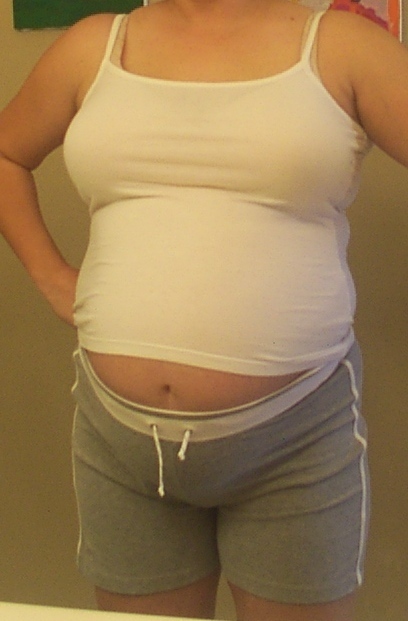 I have size large tops from my first pregnancy that are tents on me, yet I have to buy XXL for new stuff? Why are maternity clothes getting smaller? I guess because they're made with lycra they think we enjoy having them plastered across our bodies. I don't think so! Here's the front view. Man, those shorts are painted on! Today is Jan. 1 2006 and I'm exactly 22 weeks. I hope you all had a wonderful New Year's eve and drank a glass of champagne for me. I am looking forward to 2006. This is going to be a good year for me. I've already decided that I am going to try to be more positive this year and do away with the negativity. Life is too short to wallow in misery. 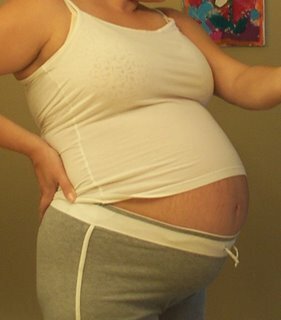 Good lord, I'm huge! The old me would tear myself down for being so large at this point in my pregnancy, but instead I am focusing on how marvelous my body is for being able to create a new life. I'm blossoming. Yes, I blossom more than others, but that's me. That's how my body works. I have 4 months left and I am determined to enjoy it. This will be my last pregnancy, so I am going to make the most of it. Happy New Year to you all! I hope you all have a great New Years Day. We're off in a bit to eat dinner with my in-laws. We're having fried chicken and the traditional black-eyed peas and cabbage. Good health and wealth to everyone.